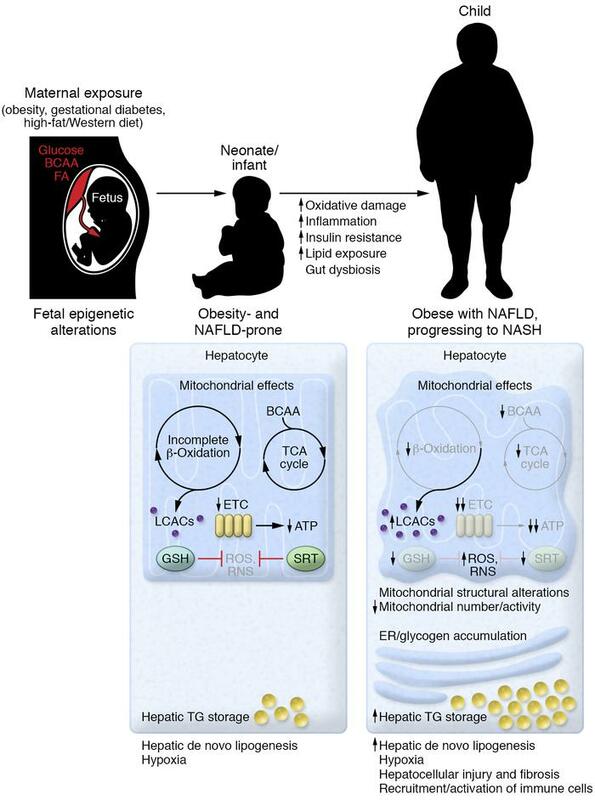 Overview of the early development of NAFLD and progression to NASH in offspring of overnourished mothers. Based on nonhuman primate and limited human data, offspring exposed to overnutrition in utero have increased hepatic lipid storage and de novo lipogenesis, coupled with incomplete β-oxidation and diminished electron transport chain (ETC) activity, leading to accumulation of long-chain acylcarnitines (LCACs) and diminished ATP production. Anaplerosis through branched-chain amino acid (BCAA) catabolism compensates for limitations in TCA cycle intermediates. This fuel overload and excess in lipid result in production of ROS. Damage is mitigated by glutathione (GSH) and upregulation of SIRT1 (SRT). Hepatic apoptosis is minimal (but existing). As time progresses and damage, inflammation, and lipid accumulation worsen, mitochondria develop structural abnormalities and diminish in content and activity. This is exacerbated by diet and the microbiome. β-Oxidative function and ETC activity worsen. Intramitochondrial lipid and acylcarnitine accumulation leads to increased ROS and reactive nitrogen species (RNS) production. Glycogen and smooth ER accumulate. BCAA catabolism is less efficient and is unable to supplement the TCA cycle, and GSH is no longer able to dampen oxidative damage. Inflammation due to infiltration and activation of immune cells and apoptosis worsen, leading to liver injury and fibrosis. FA, fatty acid; TG, triglyceride.